January is my father’s birthday month and the time of year I miss him most. Food is a major portion of my most fond memories of him. 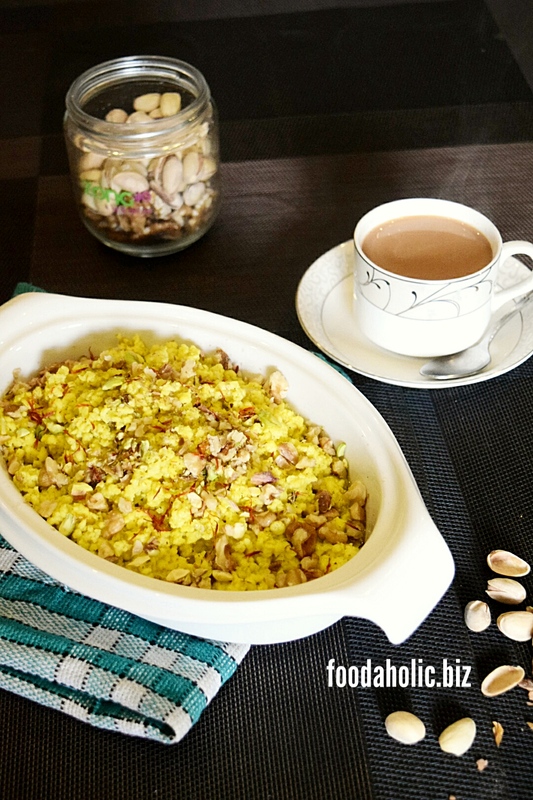 Hailing from a farming family of Punjab, he had many simple and hearty recipes up his sleeve – one such recipe is this Anday ka Halwa that he loved to prepare for breakfast. It’s a traditional South Asian dessert, more popular in rural Sindh and Punjab – a delicious comfort food! It’s the kind of recipe that you won’t find on restaurant menus or in celebrity chef cookbooks. Such recipes are usually passed down as family heirlooms from generation to generation. And what better treasure than the sweet memory of food cooked with love to pass down to our children! Halwa is a popular confection with many varieties in numerous cultures. But most food historians believe that it was invented in Arab cuisine. In Arabic ‘halw’ means ‘sweet’. Unlike most varieties that require lots of time and elbow grease, such as Gajjar ka Halwa , Anday ka Halwa gets done pretty fast. Topped with nuts and dried fruits, it’s a treat in cold weather. Anday ka Halwa is very quick and easy to make with ingredients that are kitchen staple in almost every house. It can be served for a hearty breakfast, a delicious dessert or a quick snack with the afternoon tea as guests walk in unannounced. My father used to make it with just milk, I add some powdered milk too for a creamier and more put together texture. Also I have substitited sugar with stevia in my recipe but you can use sugar to suit your taste. Heat ghee or oil in a non stick or heavy bottomed frying pan on medium heat. Add cardamom seeds and fry for a minute till you can smell the amazing aroma. Add milk and saffron, bring to a boil then reduce heat to a simmer. Add sugar, stir for 2 minutes till the sugar melts. Beat dry milk with eggs, add to the milk mixture and stir to mix. Stir constantly as the milk begins to reduce. Let the Halwa cook till eggs are set but still soft, the milk is reduced enough to become one with eggs. If you like the consistency of the eggs harder then cook till oil or ghee separates from the Halwa. Garnish with raisins, almonds and pistachios, serve hot. Your dad will always be a memoirs and his presence is instill in your memoirs. I too misses both my grandma as both are really a great cook and always enjoyed their food. This Halwa sounds like scrambled eggs with milk and spring onion chilli and tomatoes which my grandma used to make for us. Agreed with Kenta nuts have plenty fiber – legumes; unfortunately I am allergic to some nuts especially pitaschio. Agreed with Azlin, I am going to lab this recipe too with a twist of me and its something old from grandma, something borrowed from you and something new I am going to create. I enjoy all savoury versions of scrambled eggs. This one turns out very different from them. Hope you’ll enjoy. Thank you, Lisa. Food revives some of the happiest memories for us and makes the longest lasting of bonds. I’m sure he’s alive in you and your memory, Maria. All people I miss are in my mind and my treasure, as well. I’ve had scrambled eggs with milk, without sugar, that tasted rather sweet, but never without nuts. This is a great idea, as eggs contain lots of proteins but no fibers, which nuts have plenty! Thank you, Kenta! To keep our loved ones alive in us, we need to practice and pass on their good values and things we have learnt from them. This is my small tribute to him. The recipe sounds a little quirky but I’m hoping you will enjoy it. My heart goes out to you, Maria. I can’t imagine what it must be like. I miss my dad too and regret that he was out of our lives for too long. I’m trying to imagine what this must take like. Sweet scrambled eggs? I’ll have to lab this recipe soon! Thank you, Lin! You are a love! I too wish now I had spent more time with him, there was so much more I could have learnt.